"Je nach der Motivation der Entwickler kann sich app.net also als Facebook, Twitter, Instagram, Chat oder Forum präsentieren. Dabei müssen die Entwickler nichts anderes machen, als die bestehenden Daten anders darzustellen. Es werden keine weiteren Daten bei den Entwicklern gespeichert. Alles befindet sich weiterhin direkt in app.net." Mit Ohai ist nun eine App erschienen, die das tatsächlich umsetzt. Es handelt sich um eine Art Tagebuch-App, bei der Checkins, Fotos und Texte in einem privaten Channel in App.net gespeichert werden und auf Wunsch auch in einem öffentlichen Post dargestellt werden können. 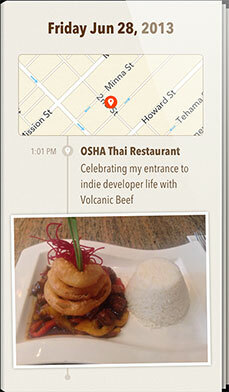 "Ohai lets you save location check-ins with photos to a beautiful and simple digital journal. You can share them to App.net and Twitter if you want, but you don't have to. All of your check-ins and their photos are stored safely in a private part of your App.net account. And App.net is a sustainable API in service of their customers and developers, so I can rely on it for a long time. One other cool benefit of using App.net for the backend is that the data specification is publicly available. This means other developers could build apps that recognize your journal. So, if the developer of your favorite camera app adds support for Ohai journals, they could save those photos into your journal. Then, the next time you open Ohai, those photos are available. Other developers could build journaling apps for other platforms like Android, or even write competitive apps for iPhone. You as the user would not have to export your data and re-import it; it would just all appear when you logged in. It's a wonderful deal for customers to have no lock-in at all, with open data standards for interoperability." (via Entwickler-Blog). Hier gibts noch ein Review.